Google Allo has just recently bagged an update after a long time. This update, v26, does not reflect any changes on the surface but a teardown of this app reveals several new features that are currently under development. Allo is said to be working on this feature for quite some time, where it’ll enable users to find and interact with other users via their Gmail contact. 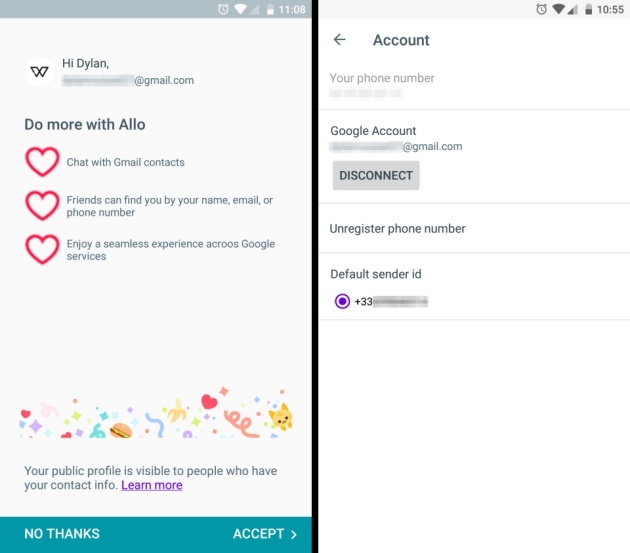 You soon may not require phone numbers to be able to interact with other Allo users and unregister it. But, the users would no longer be able to discover you using the same. This functionality has also led Google to develop a default “sender_id” feature, where you can choose which contact info you’d prefer to use with Allo. The current default is a phone number, but it could soon be your Gmail account as well. This sounds like Google wants to kill Hangouts and want users to switch to Allo and Duo for carrying forward all conversations. If you didn’t already know, the highlight for Allo has always been the fact that you could turn to Google Assistant at any point of the conversation to ask for help. And calling the Assistant in the middle of the conversation cluttered the chat with results from the same. Also, you don’t know what Google Assistant is going to share in the conversation until it has been posted. But, the teardown now suggests that Allo is implementing a new feature where the Assistant search results are displayed and you can choose if you want to share them in the chat or not. All of the Assistant queries might soon be shown in a pop-up window, right above the message box. The Allo team is also working on a new feature called Scene Generation, which will enable users to get image/ sticker suggestions when they begin typing text into the message box. This feature has been under development since v 23, but the latest app update suggests that the suggestions are created just for you — depending on what you type. This means that Allo would most likely merge or dissect images to build a unique “scene” for you. As if emojis, stickers, and GIFs weren’t enough, Google has been working to implement a host of camera effects in Allo to make yet another expressive feature available to users. The newest one that’s been found in this teardown is called “shocked breaking news effect” and would possibly come in handy when you want to break a huge news to all your friends in a group conversation. Every major social platform has placed importance on developing camera effects because visual content is the future. It seems Google is looking to compete with Snapchat and all other Facebook-owned apps with this feature. This means Google Allo is about to get a whole lot interactive with the rollout of these new features, which is not a guarantee. Google is currently developing these, but it’s not sure if all of them will make the cut.